Major Ernest Pettigrew (retired) leads a quiet life in the small rural English village of Edgecombe St Mary where he values the proper things that Englishmen have treasured for generations - honour, duty, decorum and a properly brewed cup of tea. The Major takes pleasure in his well-organised and rational life until he finds out that his patronising son, and the kind yet interfering ladies of the village, seem to have their own, rather special plans for him. It takes news of his brother's death, though, to open the Major's eyes to Mrs Jasmina Ali, the village shopkeeper, and confound all those carefully laid plans. Drawn together by their shared love of literature and the loss of their respective spouses, the Major and Mrs Ali soon find their friendship blossoming into something more. But although the Major was actually born in Lahore, and Mrs Ali in Cambridge, village society insists on embracing him as the quintessential local and her as a permanent foreigner. A most unlikely hero, Major Pettigrew finds himself contending with irate relatives and an outraged village before he comes to understand his own heart. Written with warmth, feeling and a delightfully dry sense of humour, this very modern love story will have you cheering wildly for the Major and Mrs Ali and believing that sometimes life does give you a second chance. Some time ago now one of my favourite authors mentioned that she was reading this book and really loving it, and I was sufficiently influenced enough by her recommendation to not just add it to my TBR list but to actually buy the book. Like so many other books that I buy, I didn't actually get around to reading it, so when I saw that there was going to be a blog tour for this book, I had the added impetus, and deadline, that I required! I should have read it earlier. 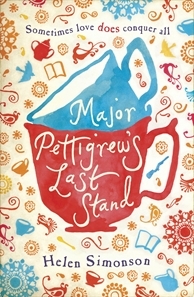 Major Ernest Pettigrew (retired) is a widower who lives a very ordered life. He has a very strict sense of right and wrong, and a very strong sense of exactly how things should be. He believes in the proper use of appropriate titles (you would never catch him introducing the local nobility as anything other than Lord Dagenham), he despises the dreadful themes that the local golf club of which he is an active member keeps on choosing for their annual ball (he would much rather have a black and white dress code), his most prized possession is one half of a pair of Churchill shooting guns, and he has an innate sense of honour and duty (which is quite at odds with his only son's more modern lifestyle). As the Major and Mrs Ali get to know each other more, they gradually draw the attention of the other villagers, causing quite some consternation. Mrs Ali is seen as a foreigner and Major Pettigrew as the quintessential English gentleman. The irony is that the Major was born in Lahore in Pakistan, and Mrs Ali was born in Cambridge and has never been any further than the Isle of Wight. Along the way both of them must contemplate what is their duty, and when does their own happiness becomes more important than the expectations of friends and family, and what it is that is really important in life. This really is quite a deceptive book in some ways. As you are introduced to the main players in the story the reader floats along the story like boating on a gentle flowing river on a sunny day. There are the foundations for the story being put in place but you almost can't see it happening. It is only as you get a bit further into the novel that you realise that many of the themes being discussed within the pages are quite weighty including the development of the English countryside, the gap between two very different generations, racism, cross cultural relationships, and the expectations of behaviour for women in some cultures. The cover at the top left of my post is the Australian cover, which I must confess I wasn't all that fond of, but I did love the internal treatment. At the beginning of each chapter there was a small icon to denote the chapter beginnings and that was mostly relevant to the events of that chapter, ranging from tea cups, to birds, to milk jugs. Having finished the book, the cover has grown on me a little more. The cover on the right is the US edition. In the pages of this book you find an unusual romance between an unlikely couple, important issues, humour and oodles of charm. You could do a lot worse than pouring yourself a cup of proper tea and immersing yourself in the world of Major Pettigrew and Mrs Ali for a few hours. To find out more about this book and the author, Helen Simonson, click on the following links. Great review! This one has been on my list for a long time, and I have read a lot of positive reviews of it. It sounds like a book that I could really sink my teeth into, and I am going to have to go out and score my own copy. Glad to hear you loved it! I really enjoyed this book. The characters were charming and believable. All of my friends have read it and enjoyed it too! wonderful review, I've seen this book every where. I've got to put it on my TBR. me three - I've heard good things about it for some time but haven't picked it up yet. sounds like a beautiful story. maybe you'll push me over the edge. I just got a copy as the reviews have been so good. Thanks for sharing. I bought this book given the great reviews I've read of it. I really must get around to it! I think this is the first review I've read of the book (positive and negative!) that hasn't used the word "charming" at all and "charm" only once. Kudos! Biblibio, I must have taken it out, because I definitley thought it! Sam and Diane, hope you get to read it soon. Pages of Julia - I could give you a little nudge if it will help. Kaye and Zibilee, I hope you do! Mamajulie, I can see how this would be a book that would attract a whole heap of different types of readers. Thank you! I needed someone to recommend a good adult book for me, and this sounds perfect. Like the Australian cover a little better-- don't know why. I read this book about a month ago and your review made me feel nostalgic! Great review! I have heard from so many people that this book is fantastic. I'm going to have to add it to my reading list this year. Thanks for showing the Aussie cover - I love comparing things like that! Excellent review Marg! I am reading this now and agree with the deceptiveness of the story. You feel like not much has occurred and then you realize how much has happened and it brings a smile to you.